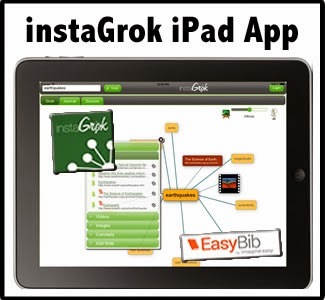 instaGrok has just released a free iPad app. The app combines the functionality of the web based version with interactivity to support learning on the touch screen. instaGrok is an intelligent visual search engine and interactive learning tool that collects content and displays it in the form of a cloud of related words. The tool is very appealing because it offers a variety of multimedia features to meet the unique learning needs of students. Students use the the visual mode to collect content, then they use the integrated journal to sort through collected content and take notes. Click on the push pin to add content to the journal then add original thoughts and ideas as notes. The journal can be emailed or printed for convenience. The last time I shared instaGrok through this blog I included a wish list. On that wish list was a suggestion to integrate the tool with EasyBib. I am very excited to announce that the teams have worked together to build information literacy and digital citizenship into the instaGrok interactive learning process. instaGrok collects sources pinned to the concept map. 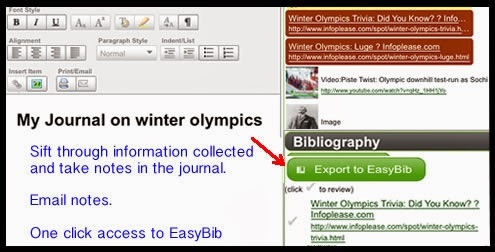 The web based version exports sources with one click and imports them to EasyBib for creating citations. The iPad App launches a screen requiring students to evaluate the credibility of the source. Students with 1:1 iPads will most likely find this app extremely useful as they dig deeper into content through research and improve their ability to express learning through writing. Download the instaGrok app from the iTunes Store.